Why Are People Still Surprised That Aquaman Is A Badass? You've heard the jokes, seen the memes. Even when Zack Snyder unveiled the tattooed, Khal Drogo-ized Aquaman of the DC movieverse, many saw it as a response to the character's perceived bad rep. But Aquaman has been formidable for years. Here's a complete history of Aquaman's rise to badassery. Despite his stature today as one of the most important heroes of the DC universe, Aquaman started out as little more than a support hero. He made his début in More Fun Comics, an anthology title skewed towards younger audiences, and he wasn't exactly the conflicted man-of-two-worlds that he is in the comics today. His original origins were that he was a scientist, trained to survive underwater and communicate with sea life. He rode around on seahorses, and tended to shy away from violence. Even in the transition to the Silver Age, he had a cutesy octopus side-kick named Topo that Aquaman trained to play instruments and sing Happy Birthday. In a bid to bring the character up to a more superheroic level - Aquaman's original foes were Nazi U-Boat commanders during the war, or pirates, rather than supervillains - in the late 50's the character's origins were re-written for Adventure Comics (the character wouldn't get his own standalone series until 1962, after he'd been established as a founding member of the Justice League). Revealing his alter-ego as Arthur Curry, Aquaman became the child of a human father and an outcast woman from the underwater city of Atlantis. Now his power to control underwater animals was telepathic, rather than linguistic, he gained a semblance of superstrength - but to keep him line with the likes of comrades Superman and Green Lantern, he also gained a weakness that would ultimately doom his public perception for the rest of the 20th century: if Arthur was out contact with a body of water for more than an hour, he would die. Along came the 70's animated classic Super Friends­ — and later the All New Super Friends Hour — which would push Aquaman's reputation to all new lows. Aquaman's superstrength was relatively played down in the TV cartoons — leaving only his telepathic command of sea creatures, and his ridiculous new limitation on his powers, as his defining traits. Even though he was a founding member of the Justice League, Super Friends treated Arthur just like he had been in the first two decades of his existence — he was a supporting hero, and contrivances made to keep him relevant ended up turning him into a joke. Aquaman's control of sea creatures most often portrayed merely as the ability to talk to them, rather than command, giving rise to the joke that would define pastiches of the character on everything from South Park to Spongebob Squarepants to MTV and Adult Swim. Superman was a near god, Batman a badass, Wonder Woman an Amazonian warrior. What good was a hero that could talk to fish? How Do You Solve A Problem Like Arthur Curry? Super Friends treating the JLA founder as a third-rate hero was emblematic of a wider problem with the character at DC. Creators didn't really know what to do with the character — at his most interesting, he was part of the Justice League, but in comparison to his more popular and well-established allies, there wasn't much to be done with Aquaman. The cancellation of his solo series in 1971 while the likes of Batman, Superman and Wonder Woman thrived and developed in their own comics meant that Arthur was resigned to a support role once more, criss-crossing between other books without getting the time to grow the character. The need to be around the Justice League in order to seem interesting exacerbated the character's other problem — his need to maintain contact with water to survive and to use his telepathic abilities (sure, he had superstrength, but superstrength was available in spades in the League). You could only come up with so many contrivances to keep the League involved in aquatic adventures, and while they were jetting around the world and going into space, Aquaman was ineffective in such environments — and the lingering spectre of Superfriends kept him that way for a while. As important as he was in the 60's, it would really be the 1970's and 80's that generated, and hardened the popular image of Aquaman as a wimp. All that would begin to change, at least in the comics, in 1989. Tired of being limited by what the character could do, Robert Loren Fleming rebooted the character once more in Legend of Aquaman #1. The character's Silver Age re-imagining would be largely kept intact, but Fleming made some changes, to bring character depth and conflict to the character that comic readers today are already more familiar with. The limitation of the character's powers being restricted to the sea were gone, but the biggest change was Aquaman's heritage. Arthur Curry was no longer the child of an outcast, but the son of Atlantean royalty — discarded to the surface world by his mother because of his blond hair, seen as a curse in Atlantis, and raised as a feral child before his Lighthouse keeper father took him in. Arthur returned to the underwater world for a while, and eventually succeeded his mother as ruler of Atlantis, taking a wife and having a son before emerging as a superheroic force to be reckoned with. This Aquaman was no longer a supporting star but a leader — he commanded armies as well as the sea. And a no-nonsense attitude to violence let him stand alongside, and sometimes in contrast, to the Justice League as an equal — not just in power but in tragedy, thanks to the death of his son and his wife being driven insane. Aquaman's adventures continued across various creative teams across the 90's and early 2000's, before the Arthur Curry character was put on hold by DC — he went missing and was eventually murdered in 2006, and Aquaman became little more than a myth rarely seen by other heroes. Despite the break, and the inconvenience of death, Arthur was brought back as Aquaman in the 2011 reboot of the DC universe. 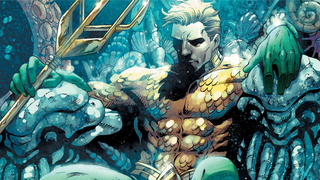 A timely focus on the environmentalist nature of the character (in the new 52, Aquaman abdicates as the King of Atlantis to return to heroics following humanity's poor treatment of the oceans in his absence from the surface), as well as a metatextual acknowledgement of the character's poor public perception outside the comics and a re-solidification of the reboot established by Fleming in the late 80's re-established Aquaman as an equal alongside his fellow Justice Leaguers. Time will tell if his Batman v. Superman cameo, Aquaman or the Justice League duology will change Arthur Curry's reputation in the mainstream, but as far as the comics are concerned, Aquaman has long been a badass worthy of his allies. Let's hope the movies will treat him that way too.